It's an absolutely beautiful day, and the end of another long and crazy week here at Noma. This post will be noticeably shorter just because there is simply less new stuff to report on. After the announcement of Monday's award, the restaurant has been more intense than ever. Waking up at 7 in the morning and after a full 16 hours of work getting back into bed around 1:30am each day. My feet and legs have never burned so much. The atmosphere in the kitchen has changed a little. Definitely a stricter discipline during services. Rene has certainly been more on edge than ever. Loud outbursts that lead into a full shouting-fest out back have pretty much become the norm. There's a lot on the line. The food must be perfect. Every single plate. Every single component. Pretty scary thought when you really think about it. We're now booked solid for every service. Each and every table is filled. The demand for a seat at Noma has been overwhelming. Based on how many days a year the restaurant is open and how many seats we have in the restaurant, it's been calculated that the restaurant can take 17,000 reservations each year. Here's the stunner: Within the first 24 hours after the award was announced, there were 100,000+ reservation requests made. I'll let you do the math. It actually got so out of hand that it shut the server down completely. The restaurant's reservation system had to be moved to a "super server". Also because of the insane amount of e-mails that were flooding in each day, 2 new office assistants had to be hired. Just to answer e-mails. Figured it's about time to offer up a recipe from the Numero Uno itself. This won't happen often, in fact it's probably the only time that it will. You'll just have to go work there yourself to get the rest. Understand that many of the recipes at Noma aren't really that strange or out of the ordinary. They're not using all kinds of crazy powders and chemicals. Folks, one of their dishes is simply pickled vegetables and bone marrow. That's it! It doesn't get much simpler. What puts them ahead of the rest is that each component is whittled down to the most refined it could possibly be, there's nothing rustic about it. And each pickle dish (specifically speaking) takes about 10 minutes total to plate. The flavors are clear, bold, and real. No foams, no dehydrated blah blah blah or reconstituted sous vide mish mash. We're talking real cooking here. Anyway, back to the recipe. 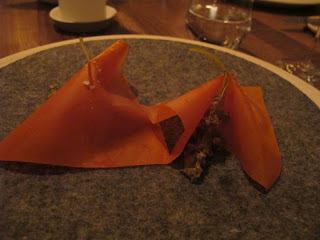 This is the recipe for the Carrot and Sea Buckthorn Leather. This is currently served with pickled hip rose petals although here it is pictured with pickled elderflower. The leathers are the first bite of food a guest receives. They are meant to awaken the taste buds and clear the palate. The leathers are light and refreshing and fairly tart (which in turn produces saliva and cleanses your palate without leaving an aftertaste). -Combine the two juices, then divide in half. Put one of the portions of juice in a saucepan with the pectin and sugar. Bring to a boil for 10 seconds. Remove from heat and whisk in remaining juice. Allow to cool slightly and pour thin sheets onto a silpat or other nonstick surface. They can be dehydrated overnight in a dehydrator, or (what we do at Noma) is simply leave them out on the silpats to dry naturally. This takes about three days. When the leathers are set, they are cut into perfect squares using a square cutting mold. They are held between sheets of parchment paper in the refrigerator. -To serve, each square is lightly brushed with a reduction of sea buckthorn juice so the leather does not appear dry. The leathers are pinched from the middle and places on a cloth mat. Three pickled rose hip petals are placed on the leather after which a small sprinkle of sea salt is applied. And that's it! Pretty simple stuff... Everything here is that way. Just clear directed flavors presented in new and unique ways.